Yoga Instructor Saskia Thode grew up in Northern Germany in the backyard of Wacken Open Air, listening to metal and already going to festivals as a young teenager. Her yoga practice started there in 2003. 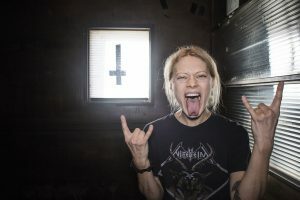 She moved to New York City in 2006 and has been a part of the metal and yoga scene there ever since. Yoga and Metal have been an essential in her life in the city to stay sane and escape the big city. To combine to the two worlds and passions she created her Metal Yoga Class in 2014 after completing her first 200 hour Vinyasa Teacher training. Saskia has studied various lineages of yoga, the wisdom of Tibetan Buddhism, Indian Yoga, and the Fourth Way. She was also certified as a Therapeutic Yoga Practitioner, a Chair Yoga Teacher, and Reiki Practitioner of the 2nd degree. In Metal Yoga she takes spirituality and the worship of metal to a different level. Be prepared to completely tap into the dark side, to scream, beat, sweat, and do anything you need to do to unleash your inner beast. Listen to your favorite blasting metal tunes while letting your body burn with hellish heat. Move and breathe while listening to your favorite bands. Raise your metal horns (mantras), and offer your practice to the darkness. We will be holding poses until we are feeling their hellish fire creeping into our bodies until we rest like the dead in Corpse Pose in the end of the class. All levels are welcome and especially the ones who never dared to try yoga.